MoMA will launch the first workshop for "Uneven Growth: Tactical Urbanisms for Expanding Megacities" starting Saturday, Oct. 26 at MoMA PS1 in New York City. 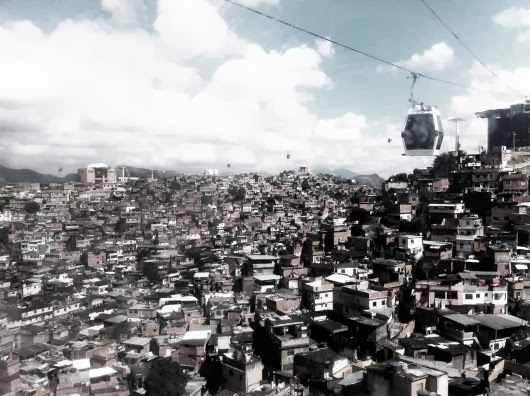 In this workshop series, six interdisciplinary teams will propose innovative ways of how to perceive urban growth as a response to the disproportionate expansion and its potential consequences in six of the world's metropolises. The workshops will also open these pressing issues to public discussion. The proposals will then be exhibited at the MoMA PS1 in November 2014, the second phase of the Uneven Growth initiative. Morro do Alemão, Rio de Janeiro, 2012. Photograph by Pedro Rivera, RUA Arquitetos. "The Museum of Modern Art announces a 14-month initiative to examine new architectural possibilities that address the rapid and uneven growth of six global metropolises: New York, Rio de Janeiro, Mumbai, Lagos, Hong Kong, and Istanbul. Organized by Pedro Gadanho, Curator, Department of Architecture and Design, Uneven Growth: Tactical Urbanisms for Expanding Megacities enlists six interdisciplinary teams of international architecture and urbanism scholars, experts, and practitioners to participate in a series of workshops that begin on October 26, 2013, with each team focusing on a specific city. The resulting proposals will be exhibited at MoMA from November 22, 2014, to May 10, 2015.Uneven Growth is organized by MoMA in collaboration with the Museum of Applied Arts (MAK), Vienna. For the workshop phase of Uneven Growth, teams are challenged to create proposals that offer new and inventive ways of thinking about the growth of cities. The design teams develop projects under the curatorial and critical guidance of MoMA’s Department of Architecture and Design, and an advisory board that includes such leading figures as Saskia Sassen, David Harvey, Ricky Burdette, Neil Brenner, Nader Tehrani, Michael Sorkin, Marc Angélil, Teddy Cruz, and others. The workshop phase launches on Saturday, October 26, 2013. Following an initial workshop in the VW Dome at MoMA PS1, workshops are also planned at The Value Factory in Shenzhen, China, in December 2013, and at MAK, in Vienna in June 2014. These events will produce responses to the theme, while bringing the larger discussion to the general public. For the second phase of Uneven Growth, MoMA will present an exhibition of the resulting proposals, beginning on November 22, 2014. At the center of the exhibition will be design visions for the near future of the selected cities, comprising drawings, renderings, films and animations to be produced by the six teams during the workshop period. The final result will be an exhibition catalogue that brings together each of the proposals and groundbreaking essays about the subject..."